Plans like this and a general sense of enthusiasm really made the event more communal and exciting for me. I began to conjure up my own plans. First, to design and screenprint some postcards to send out to friends or to whoever requested one through the event page. 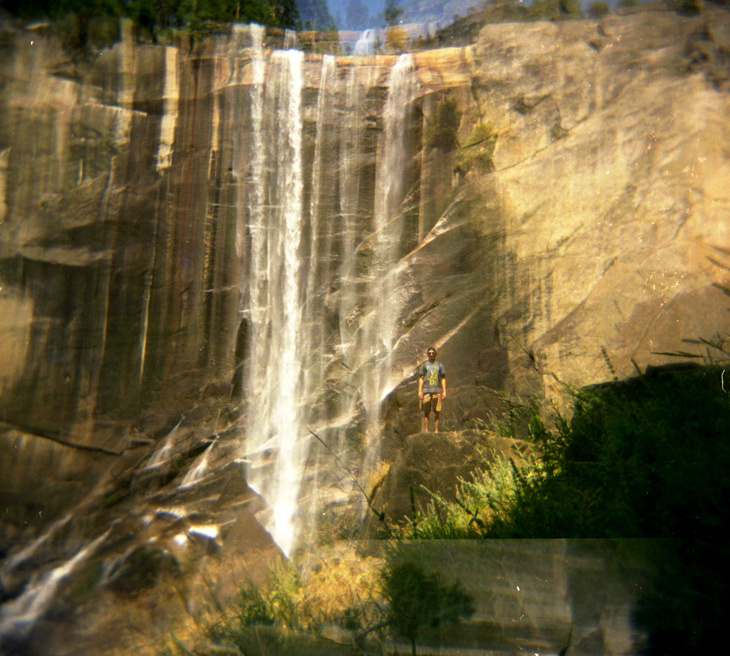 Second, a weekend of camping in Yosemite and photography with my trusty Holga camera. Below are some of the better shots that I got with my Holga in Yosemite, one of the most beautiful and majestic places I have ever been to. I went with my parents, brother, and cousins. The photos are of our hike to Vernal Falls. I got some really cool light leaks and natural vignettes, reinforcing my love for analog (lomo) photography. Above: my dad sitting in the spot we stopped to eat lunch. Vernal Falls is in the background framed by the trees. My brother Ryan standing in front of Vernal Falls. Double exposure. 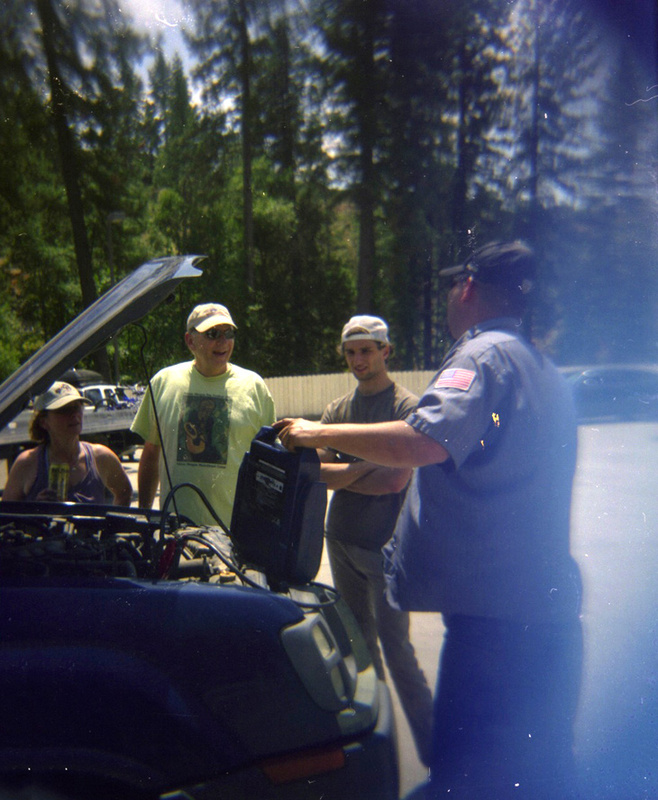 The car broke down on the way out of Yosemite. Fun way to wrap up Analog Day! Yes, we had turn on the cell phone to call someone to jump the car. This is Bi, a good friend of mine, who actually went shark fishing on the east coast on Analog Day. He caught 5 sharks! Ah the smell of fresh ink on paper! A few days ago Joel Felix and I ventured to San Francisco Center for the Book to attend an Intro to Letterpress Printing workshop. It was so exciting to get to "know our roots" a little better while getting down and dirty with some real printing. We geeked out as we discovered cases full of some of our favorite typefaces cast in metal blocks — Futura, Garamond, Bodoni, Univers, and much more. We learned the basics of setting type (which took an unexpectedly large amount of time since it is so difficult to handle and has to be set upside down and backwards), as well as how to properly ink & operate a Vandercook cylinder press. The Vandercook is arguably the most popular letterpress machine, and is ideal for printing everything from invitations and stationary to larger for posters and broadsides. SFCB had four of these bad boys! I'd get one myself if it weren't somewhere around $10K to acquire one. Eeek! I refuse to say that Letterpress is a dying form of printing. As we continue to move more and more into an age of digital printing, alternate printing methods such as letterpress and screenprinting will just gain value because of the unique and tangible characteristics they produce. It is not as efficient or cost effective, but then again, I'm beginning to believe that nothing worth doing is easy. Plus it is always fun to get away from the computer and get my hands a little dirty. Our small project this time was two greeting cards. Of course, we couldn't just settle for a typical phrase, so Joel came up with "You are the cheese to my macaroni" and I followed suit with "You are the butter to my biscuit." Both were set in the beautiful Bodoni Ultra face. We are thinking about selling them as a set. If you're interested, SFCB offers a variety of classes, including this 3 hour letterpress workshop a few times every semester. Registration was only $40, and once you learn the art, you can become certified to reserve time on the presses during open studio hours. If I lived in the city, I would be there all the time. For the last few days, I've been spending a good amount of time concepting for a poster for Miami Horror, an indie-electronic pop band. I enjoy their music quite a bit so I am really excited. They have an energetic sound that is reminiscent of dance pop from the 80's, but lyrically they explore some pretty abstract and futuristic ideas. So, my concept is going to duplicate this visually: stylistically I want to reference the 1980's and have somewhat of a retro feel, but I want the content itself to have a more modern/post-modern look. To achieve this, I explored some really interesting & unconventional techniques in working with type, light, and texture. After choosing Neutraface (it has a really nice retro feel to it, but can still be interpreted to be futuristic by use of texture and style), I moved forward with experimentation — in other words, "the fun stuff." I love trying new things when the timeline allows it. Check out some of my process below. These were created by cutting the type out of paper, back lighting it, and then photographing it while doing a zoom blur with the camera. This one was made by printing out what was created above and then photocopying it a bunch of times. Photocopies of photocopies, etc. These were created by putting an image of the type on a tv screen and then photographing it. I'm pretty sure one of these will make it onto the final poster.